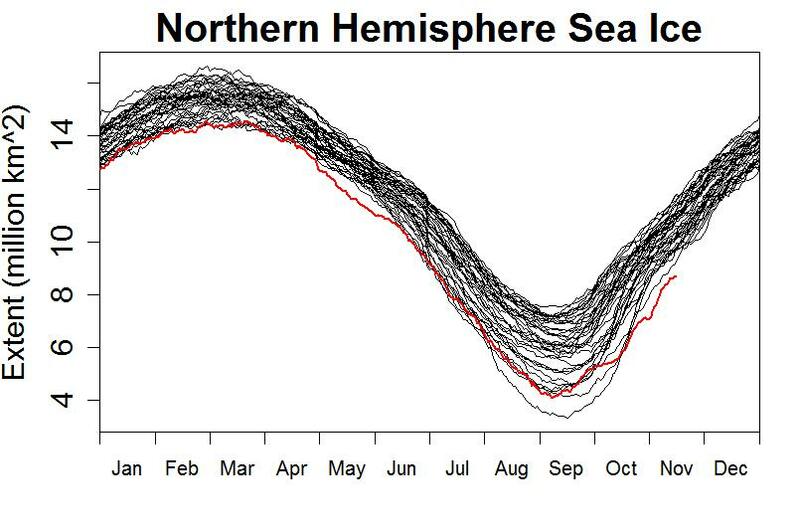 The extent and thickness of the Arctic sea ice is decreasing for every month of the year. But looking at straight lines on graphs with a relentless downward trend it’s easy to lose the geographic sense of what is happening. The red areas in the plot below show where ice was absent on 3 March 2016 compared with the mean 1989-93 at the height of the winter. I chose 1989-93 the comparison period as it is just before the start of the relatively rapid decline in we observe in Arctic sea ice. The difference between the daily ice extent, in each grid cell and the mean based on historical data for the years 1989-93. Blue shades imply more sea ice and reds imply decreased sea ice compared with the mean. The original data come from the DMSP SMMI data set at the NSIDC. As you would expect there is not a lot of blue in the plot, and the ice edge has retreated virtually everywhere. The stand out region is the Northern Barents Sea. On the NSDIC website you can see that the decline of sea ice in the Kara and Barents Seas is part of the long-term trend. Posted in Science. Tags: Arctic, extent, sea ice on November 26, 2016 by Mark Brandon. For completeness here is a gif of the growing season in the Arctic this year from 1 September 2016 to 16 November 2016. The 2016 Arctic Growing Season 1 September to 16 November. Posted in Science. Tags: Arctic, sea ice, sea ice extent on November 17, 2016 by Mark Brandon. The summer of 2016 saw the joint second lowest Arctic sea ice extent. But in the middle of October unusual Arctic weather has led to it becoming the lowest extent. At the same time, Antarctic sea ice extent has also reached record lows. Tamino has a simple and clear post about what a surprising thing this is. The plot below shows the mean November Arctic sea ice extent, the sea ice extent on 16 November 2016, and the difference between the extents from 1993 to 2016. Regions shaded at the top end of the scale (the red colours) mean there is less ice now compared with in 1993. The mean Arctic sea ice extent in November 1993, the daily sea ice extent on 16 November 2016, and the difference between them. The stand out region (to me!) is North Russia where the Kara Sea is almost entirely clear, followed by Hudson Bay, Baffin Bay, East Greenland and the edge of the Chukchi Sea. I was interested in what was going on in the Kara Sea so I made a movie of the sea ice extent from 1 November 2016 to 16 November 2016. Arctic sea ice 1 to 16 November 2016. The striking thing in the clip for November 2016 is that the sea ice extent has actually reduced in the Kara Sea! The sea ice extent in Chukchi Sea is increasing, but very slowly - and you can see from my previous image that it is very low compared with 1993. 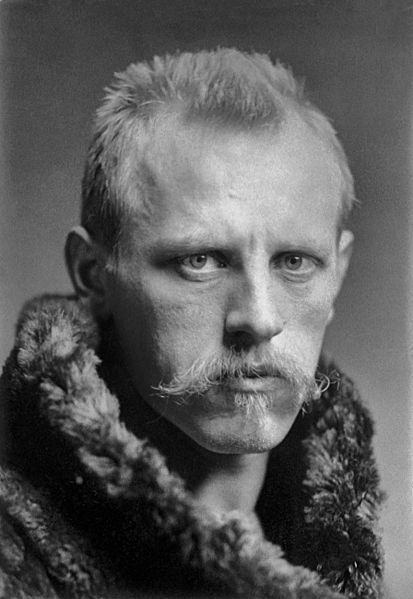 Clearly the Arctic is experiencing strange conditions at the moment. On the climatereanalyzer.org website you can see the 5-day forecast from 17 November 2016 (tomorrow). 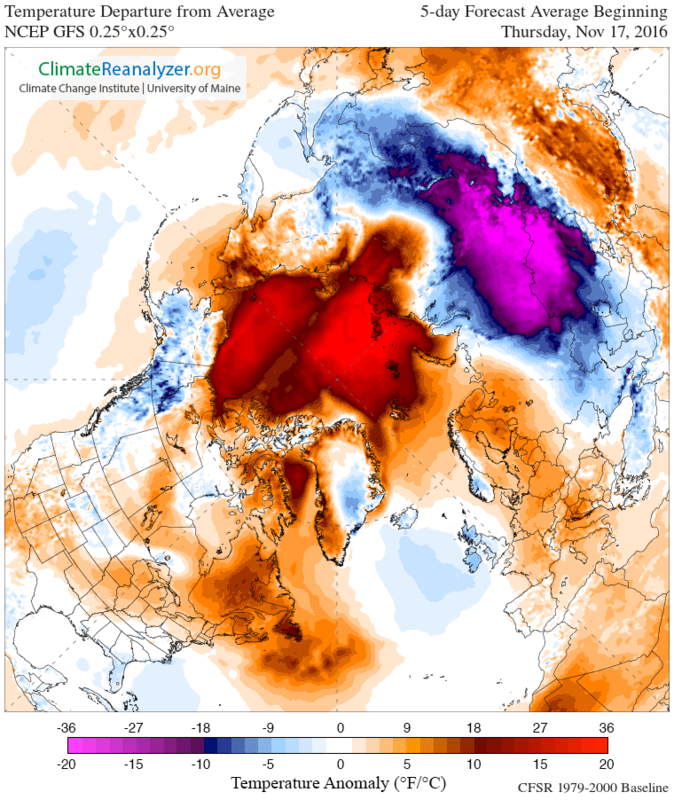 The temperature departure from average is off the scale over the Arctic Ocean. It's much colder over Russia. The 5 day forecast from 17 November 2016 from ClimateReanalyzer.org. These are astonishing observations. When the winds change and the cold air currently over Russia ends up over the ocean I would expect it to freeze up rapidly (once the surface layers have cooled). But starting so late in the year the sea ice could end up thin enough for something impressive in the near future. I made a gif of the full current Arctic growing season up to 16 November 2016. I have already written a little about the this years Antarctic sea ice extent in the Antarctic Peninsula sea ice late winter 2016, in The Western Weddell Sea ice factory, in The development of the Amundsen Sea Polynya, in Dotson Getz Polynya ice growth, and in The Prince Gustav Channel is opening. For interest, I chose November 1993 for comparison for two reasons, first it’s just before the big Arctic sea decline, and secondly I was in the Arctic for 4 months that year doing my PhD research. Tamino is noting that the global sea ice is "About 6.9 standard deviations below the 1981-2010 mean." . Amazing times. Posted in Science. Tags: Arctic, Chukchi Sea, Kara Sea, sea ice on November 17, 2016 by Mark Brandon. 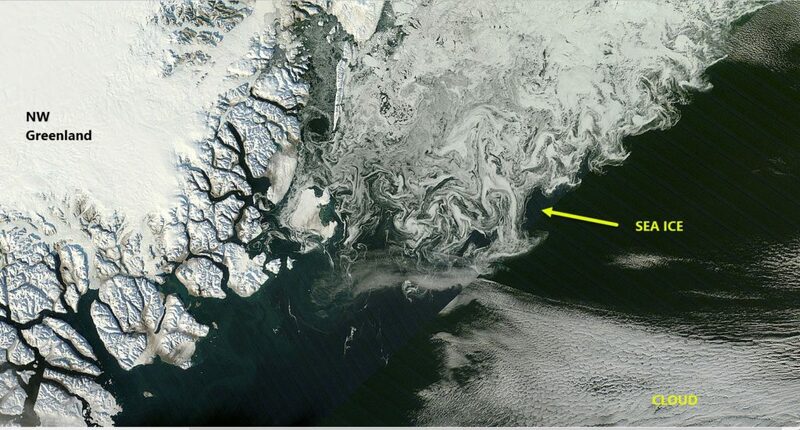 Yet more beautiful MODIS imagery showing some wonderful patterns in a plankton bloom in the Barents Sea. The screen grab is from the 250m resolution imagery, and the whole arctic panel shows just where the bloom is located. 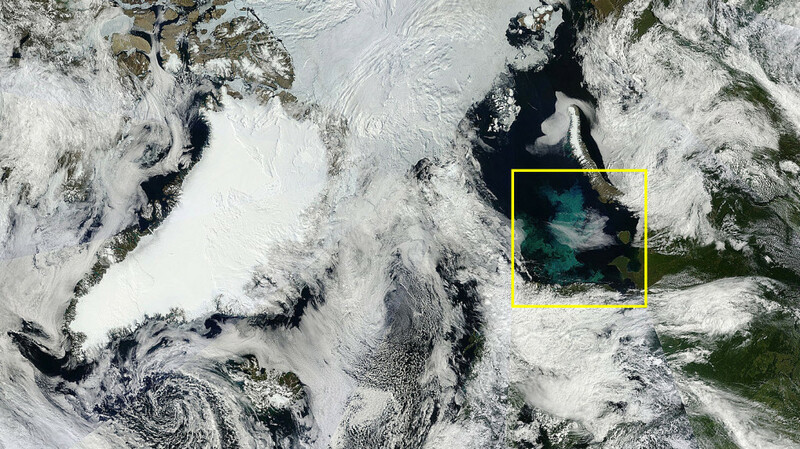 This particular region seems to show plankton blooms regularly in the MODIS imagery and the Wikipedia page has a similar (but not as nice) image dated summer 2009. Posted in Science. Tags: Arctic, Barents Sea, MODIS, plankton on July 30, 2015 by Mark Brandon. The MODIS sensor satellite imagery is showing a beautiful and evolving large plankton bloom in the Chukchi Sea at the moment. 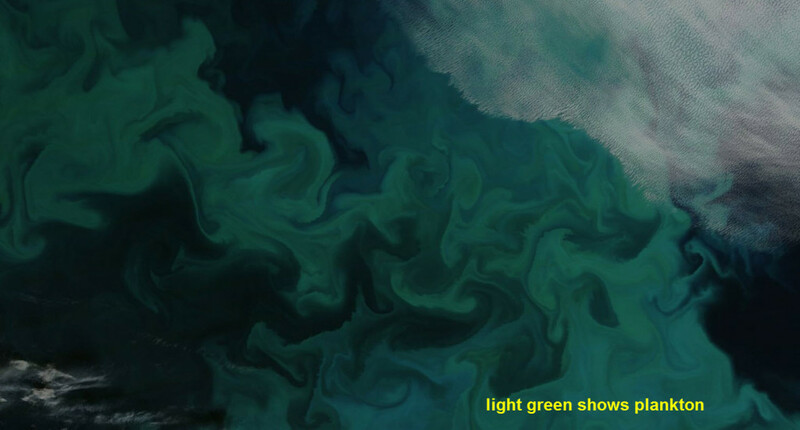 Plankton bloom in the Chukchi Sea, as seen in the MODIS sensor on 23 June 2015. Alaska is on the LEFT and Russia the RIGHT. The image is looking SOUTH. The plankton are the lighter green bands I've labelled and the full image is available at an astonishing 250m resolution. Posted in Science. 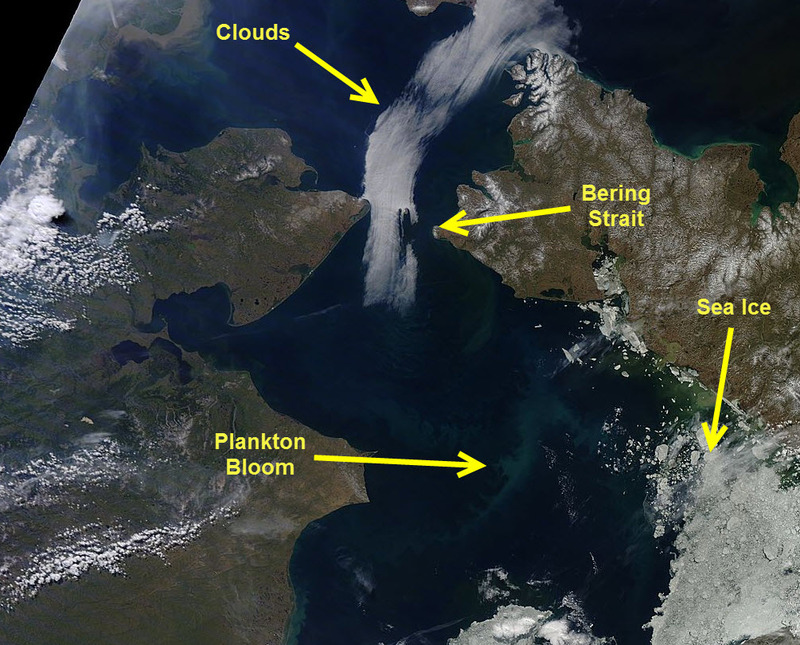 Tags: Arctic, Arctic Ocean, bloom, MODIS, plankton, satellite, Terra on June 23, 2015 by Mark Brandon.